Firework night is approaching fast and people tend to have fireworks going on the run up to 5th November too. Below is some information on Anxiety caused by Fireworks/loud noises. 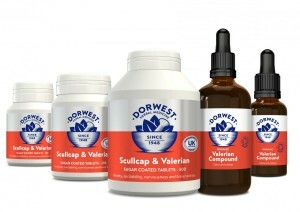 With a high success rate we recommend DORWEST HERBS- Scullcap & Valerian tablets / Organic Valerian Compound. Phobias, anxiety and nervousness can make life difficult for both pet and owner. A robust nervous system enables animals to cope with new or stressful experiences and to deal with life in our rather hectic world. It is recommended with moderate firework phobias to start giving Scullcap & Valerian Tablets 10 days before (3-4 weeks for severe phobias) and then use the Organic Valerian Compound as a quick ‘Top-up’ when the fireworks are at their worst.